The bar code in the center of the heart can be scanned by a cell phone. RFTA is trying out the technology. At bus stops where bus schedules are posted, riders will find an invitation to “Share the Love” and a bar code (it’s in the shape of a square) that can be scanned with a smart phone. 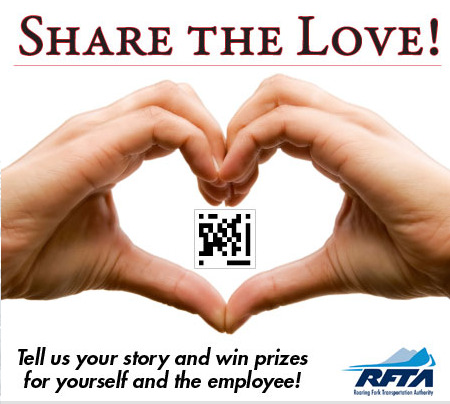 The campaign asks riders to share a story about a praise-worthy RFTA driver or employee of the transportation agency. Stories are being accepted through Feb. 14 and there’s swag in it for both story contributors and the employees who earn mention. The larger purpose of the promotion, however, is testing rider willingness to embrace the bar-code technology, according to Dawn Mullally Chase, marketing manager for RFTA. “We’re trying to see if this piece of technology is something the regular Joe would use,” she said. If it is, the technology could see broader use by RFTA. For example, riders could ultimately access and download a bus schedule to their smart phone by scanning a bar code at a bus stop. The goal isn’t to eliminate the printed bus schedule, which comes out four times a year – RFTA schedules change each season – but to offer another avenue for riders to access the information. Any reduction in the number of schedules that are printed has an environmental benefit, Mullally Chase noted. To scan a bar code with a smart phone, one must first download an app that allows the phone to scan bar codes (there are free ones available). Then, using the app, wave the phone’s camera lens across the bar code to access information. Use of the technology is exploding into countless facets as businesses use it to reach out to consumers. According to adazonusa.com., McDonalds restaurants in Japan place bar codes on hamburger wrappers, allowing customers to scan it and read the nutritional information on their meal. On a simple level, scanning a bar code can eliminate the cumbersome process of typing someone’s contact information or typing a lengthy website address into one’s phone. The bar codes are popping up on business cards with regularity. RFTA riders, however, needn’t feel that they’ve been left on the curb if they’re not tech savvy, or their phone’s not smart enough. One can participate in the “Share the Love” promotion online at http://www.rfta.com/love.html or send a note via the U.S. mail to: RFTA, 1340 Main St., Carbondale, CO 81623. While the promotion is aimed at tales of positive experiences with RFTA, the agency also welcomes complaints. Send those to feedback@rfta.com, Mullally Chase advised.